I emailed you last week on my Tang problem and I just bought a nice Purple Tang on Sunday. I am looking for a suitable replacement for my YT that died three weeks ago. If you recall, my PB is way too aggressive for my Sailfin and you suggested the PT instead. He is now in the holding tank since Sunday inside my aquarium but the PB won't leave him alone. The PB keeps thrashing his body against the holding tank and the PT is doing the same but not as aggressive. I would like to know when I should release the PT into the aquarium? The PT almost cost me 200 bucks and I hate to lose an expensive fish like that. Thank you very much. damsels, one pajama cardinal, a flame angel fish, a cleaner shrimp and a fire shrimp. These have been living and thriving in the past four years. Last week, for reason unknown my yellow tang disappeared and presumed dead. I immediate substituted him with a large 4-5 inch Sailfin Tang. However I got disastrous result as the PB constantly harassed the ST.
Now, the ST is isolated in the clear acrylic that is placed in the tank for the past 3 days. The PB looks around the cage but does not do any aggressive moves. I was told that the ST can handle better than the YT so I choose him. Should I release the ST into the tank or should I take it back to the LFS? as it is more robust than the ST. I eagerly await your expert replies. It is my privilege to have a reply from the world's renowned expert in marine fish keeping. I am quite humbled to have received your service. I will return the ST today and what do you suggest I replace my dead yellow tang with? I recently purchased a powder blue tang (2 months now) and added him to my 60 gallon tank. <... this species, Acanthurus leucosternon, NEEDS much more room than this. In the tank I have a maroon clown, yellow tail damsel, blue hippo tang and Hawaiian yellow tang. I am purchasing a 125 gallon tank but had a quick question for you guys. The mix of fish I know is a little crowded (I will be up grading soon) but prior to adding the powder blue tang everyone got along great. 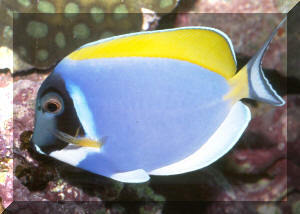 Now with the powder blue tang in there it constantly picks on the yellow tang, nipping at its tail. The yellow tang backs up to it and tries getting it with its barb on its tail. Will this aggression go away with a larger tank? Or should I plan on getting rid of the Powder blue before I add it to the 125 gallon? On craigslist today I got a 3 inch Powder Blue Tang. I wanted to see if I can put him in my main. He is as happy as can be in qt at the moment. Would this be ok? I really do not have aggression in my tank since introduction was the Koran, blue hippo, Naso, then the purple then the yellow. If anything the Naso has been in his "I want to be a jerk mode lately with his tail flapping nonsense to the purple. You guys are the bible of the saltwater hobby world. I always utilize your knowledge before pulling the trigger on a decision. No problem. Thank you for the help. Glad I'm a qt believer And did not put him in the main. Have a friend with a 92 think he will enjoy And for 20 I know he will jump. My first book was The Conscientious Marine Aquarist. In my mind, it was the best thing I could have done as I started this hobby. Okay, here is my problem. I have a 200g reef tank. I have about 200lbs of live rock and a variety of soft and stony corals. My fish include five Lyre-Tail Anthias, six blue green reef Chromis, one Maroon Clownfish, one Citrine Goby, one Dotty Back Gramma, one Six Line Wrasse, one Sailfin Tang, one Foxface Rabbitfish and one Powder Blue Tang. The Powder Blue was the last fish added. I called my local fish store and they said they would take him on a trade. Before I resort to that I just had to make sure I was doing the right thing. Are there any tricks that would help them get along? Are the three of them just too many big fish for my size tank? Thanks so much for taking the time to read and respond to my e mail. You guys really are the best! I will take the Powder Blue Tang to the LFS. Sure wish I would have asked before rearranging the rocks twice! Powder blue too aggressive for a 150gal with 2 tangs? I canÂ´t add small fish since I have a mantis that kills them all and I just canÂ´t get it out, I tried removing rocks and traps and it doesnÂ´t work. I had previously removed 3 mantis by removing rocks but this is the last and obviously the smartest. So I have a few options left, normal Naso tang is not that pretty, blonde Naso is ok but expensive, other tangs not as colorful. I like the powder blue a lot, but I know it is known to be very aggressive, however it would be the last fish to enter my 150 gal. My sailfin is very social and peaceful, the hippo tang is very shy and peaceful. What do you think?, another option is adding another hippo tang, I already have one, but IÂ´m guessing a second one would not be as aggressive as a powder blue. I donÂ´t know. <Honestly, my advice is to continue trying to capture the Mantis shrimp despite the time it takes. You already have 2 large tangs, a standard 150G tank comes in either 4 foot or 5 foot, and I do not recommend tangs large tangs in tanks under 6 feet in length, I think the reduced dimensions cause unneeded stress to the fish, which is only exacerbated by having multiple tangs in the same space. Obviously your 2 ocellaris are doing just fine though they are relatively smaller fish. I am thinking you will have better luck with small fish that are not going to dwell in your liverock, especially at night. So you do still have some options while you are mantis hunting. - Powder Blue Tang, Shoehorn Style - Hi, I currently have a regal tang about 2 inch, and am thinking of purchasing a powder blue tang. Will they fight or will they just mind their own business, as I would really like to keep one of these fishes. <Depends on the size of the tank.> My tank is 23 gallon, and has a 100 gallon protein skimmer, 55 gallon canister filter 6 pieces of live rock on the bottom, which takes up around 3 gallon, and the other 20 gallons is remaining for the fish. <This tank is much to small for the regal tang let alone a second one. I cannot recommend that you keep any more fish in this system.> Baring in mind I will have a new, and bigger set up for Christmas to move the tang(s) into. <I'd wait until you actually have the system set up and running for a couple of months before attempting a powder blue - these fish on average do quite poorly in anything but the largest systems. Please read here: http://www.wetwebmedia.com/badacanthurusaq.htm > I do know that they may be aggressive towards each other, but I don't think this will be a problem, as I have seen many different species of tang in the same tank. <Well, that doesn't make it a smart or good long-term choice. I would not place a powder blue tang in a tank of this size - please don't put this fish in your tank at this point.> Please could you fill me in on these questions, I would very much appreciate it. Regards Aaron.